Share With Your Local Planners! Neighborhoods in your community can look like this. Photo courtesy Tryon Farm (IN). Cloverdale (MN). Courtesy Randall Arendt. Include a sketch plan of greenway land, potential house sites, street alignments, and tentative lot lines, prepared according to the four-step design process for creating conservation subdivisions showing areas of proposed development and areas of proposed conservation. This is to be prepared by a landscape architect or physical planner as the first layout document BEFORE expensive and highly detailed design drawings are created for the Preliminary Plan stage. This way any deficiencies can be corrected PRIOR to submission of the detailed, expensive Preliminary Plan. The sketch plan is a carefully drawn rendition, done to a specific scale, and usually created as an Overlay Map to be lain on top of the underlying Existing Features/Site Analysis Map. They are always best done when done by hand, not on a computer screen. They can be done in the field, or right afterwards, at a "mini-charrette" involving all parties concerned. Include all involved in the process-the developer, planning commission members, abutting landowners, officials, staff, etc. - BEFORE any engineering plans are put into place in order to point out the conservation areas to be preserved. Important Note: Site walks should be advertised in the usual manner as informal Work Sessions, open to the public, at which no votes or binding decisions are taken. Site walks do not add more time, as they help the process move far more quickly, since people are no longer talking and arguing about abstract lines on paper, but real slopes, actual trees, etc., which means they really understand the site conditions. There is no substitute whatsoever for seeing the land first-hand. 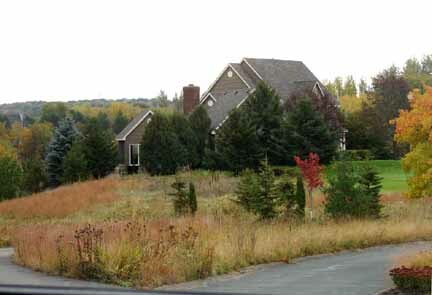 In the book Envisioning Better Communities by Randall Arendt (American Planning Association, 2010, page 21), Arendt writes, "subdivision regulations typically suffer from five fundamental flaws, resulting in flawed designs." Flaw #4: "Layouts are typically prepared by surveyors and engineers who are trained in recording site data and in street and drainage issues. They have little or no expertise in the fields of landscape architecture or neighborhood design and therefore often fail to capitalize on the significant physical, historic, and environmental features of each property." The official time clock for review starts with the submission of this plan at the on-site walkabout or at a regularly scheduled meeting of the Planning Commission. Allow safer, less-wide streets, eliminate curb and gutters (use swales instead to absorb excess water, along with rain gardens) to lower costs, recharge groundwater, and reduce storm water run off and pollution. This is in addition to the unbuildable wetlands, steep slopes and floodplains in new subdivisions. *In urban, sewered, high density areas zoned at 2-3-4 units per acre, preserving 30-35% open space, in addition to the unbuildable wetlands, floodplains, and steep slopes, is the norm. In rural, suburban edge areas at densities of 5 and 10 acres per dwelling, where most of America's new subdivisions are being and will be built, easily 70% (or more) of the land can be preserved. *LandChoices does not warrant that this provision complies with your state's laws. As such you are advised to consult with an attorney that is familiar with your state's laws. Brace yourself. Just like your current land use ordinance, this one is lengthy, complex in structure, and heavy with legal wording. You can modify it to fit your state or use it as a guideline to revise your existing ordinance and land use codes. This ordinance is written with conservation subdivisions as an option for developers. LandChoices strongly recommends you revise this, DESIGNATING conservation subdivision design as a "by-right permitted use", and classifying conventional subdivision layouts as conditional uses, or special exemptions. Note: The only reason that conservation subdivison design was not required in Walworth County is because the elected officials leaders lacked the political will to do so, and at the last moment acceded to the demands of developers that the ordinance be voluntary, so that developers could ignore it. Designate conventional subdivision layouts as "Conditional Uses" or "Special Exemptions". Link together the conserved land in conservation subdivisions. Randall Arendt's hands on conservation subdivision workshop. "There were nothing but rave reviews of your presentation." Hank Metcalf, Planning Board Chair, Orono, Maine, commeting after attending Randall Arendt's workshop. Reading these comments from workshop organizers and participants will help you appreciate how effective the workshops really are. In lieu of the workshop, developers, homebuilders and other applicants can view Randall Arendt's videotape of his Conservation Planning Slide Presentation "Creating Open Space Networks Through Conservation Subdivision Design", or read "Growing Greener: Putting Conservation into Local Codes" (PDF) (18 pages). Note: Items 1-3 will probably require some amendments to existing Subdivision Regulations. These procedural changes should not be very controversial, particularly if all parties read the article (also available in step 4 above) "Flawed Processes, Flawed Results, and a Potential Solution" (PDF) (5 pages). Hamburg Township in Livingston County, Michigan implemented conservation subdivision design and has protected nearly 2,000 acres at no cost to the community, representing a land value of $40 million. Applied on a county-wide basis, Hanover County, Virginia has protected over 5,000 acres through conservation design at no cost to the community.